We create ecstatic experiences for audiences, artists, and communities. Present Tense creates stories, songs, and events that may inspire, educate and disrupt the communities we are immersed within. Through our work we engage our collective energy, passion and creativity, and we actively share our work and our practice. In this way we consider our performances immersive. Present Tense develops and presents high impact experiences for local and international audiences. In 2011, we set out to create a music theatre work that sat above genre and style. In this work we establish space for the audience to experience, feel, touch and be activating agents in bringing the world to life. This is a work ready to be shared, anew and again: visually beautiful, strangely upended and ritualistic. Chants Des Catacombes is multi-disciplinary macabre musical theatre created by the Present Tense ensemble and popular Melbourne drum/violin duo The Twoks. 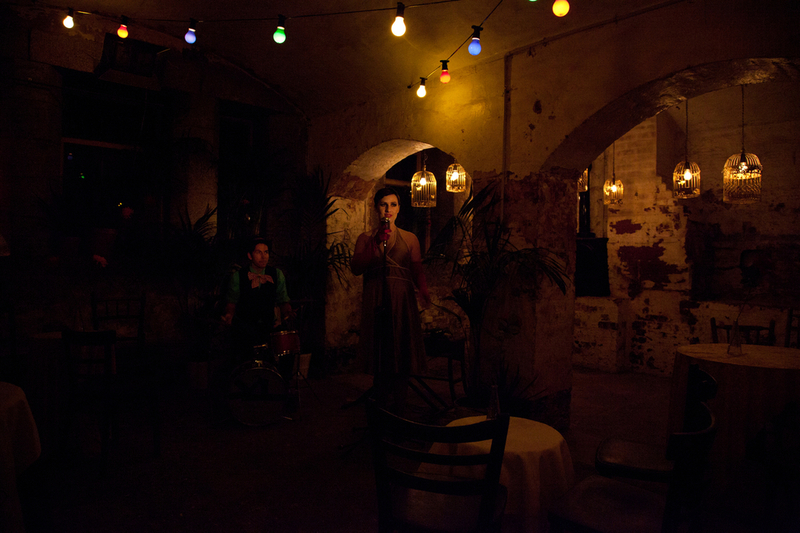 Site-specific theatre that mixes together music, dance, song, dialogue, scent, light and space, Chants Des Catacombes is like a ghost train and surprise party planned by your best friend. The story weaves together fact and mythology, alongside popular contemporary songs and classical music. After three-sell out seasons: Donkey Wheel House Melbourne in 2011, the Old Adelaide Gaol in 2012 as part of the Adelaide Fringe Festival and the Old Castlemaine Gaol as part of the Castlemaine State Festival, the next stop must be Melbourne. Rooted in the order, artistry and mythical resonance of popular and contemporary music, the resonance of memory through strangely familiar lyrics and phrases, we examine how music fragments can construct narrative to create a complex and compelling work of theatre. Through rigorous engagement of the breath, the body and the voice alongside innovative use of musical instruments, architecture, space, design, immersive elements such as scent, food and drink; we create a dream like narrative. The memories of three murdered women are bound to the tunnels. Their stories are full of complex codes, patterns and repetition, like a mystery. The highlight of the festival is Chants des Catacombes. We arrive at the gaol at 11pm. Lit by small candles, we walk the flickering perimeter and are led into a dark space. Out of smoke, three screaming prisoners appear. Above and under us, the women are close enough to touch (and we do). They merge their foreheads to ours, pleading. They crawl through our legs, begging. Their voices soar through the corridors and down the narrow stairs as we follow them: a French showgirl in a salon (we loll on her bed as she plays the harp); a courtesan dancing for the general; a surgeon (under pretence: a woman pretending to be a man). And just as I’m thinking, “why do female characters have to be so passive?” the work takes up this question directly, speaks of Desdemona and Othello, shifts a gear to take up the fight. The entire performance is told through contemporary song and dance, and undergoes a Baz treatment, morphing from the gender-bending Blur’s “Girls & Boys” to Nirvana to Portishead to Bowie’s “Let’s Dance” and even Kelis’ “Milkshake” for comic effect. I would love to see the show at the Fringe that has a better ensemble than this one. The three women were astounding in their own right, but so complete was the physical, vocal, musical, and spatial experience that it would violate the show to single one out. The extensive collaborative team are clearly across every gorgeous, brutal element of the Chants design, harmonising or dischording at will. It was electric. I was sweating. I didn’t want it to end. Every image was captivating, and the confusing immediacy of emotion – either conveyed at feel-your-body-heat closeness or empathetically felt – rings and reappears memorially long after the performance is over. Chants affects you how theatre is supposed to. Look out for the Present Tense Collective in the future. The Lovely War Project was lead by the Present Tense Ensemble in a partnership between Federation University and students, the City of Ballarat, Ballarat Heritage Weekend, the Ballarat RSL and other community organisations. It was designed to engage the whole community and visitors to Ballarat. This project activates a series of performance based events, focussing on ANZAC Day in April and then Heritage Weekend in May, with songs and performed images and moments from World War One era. The activations begin within the University performing arts curriculum and are designed to reach out to the broader community and engage the students and the public together in considering the heritage and meaning of Australia’s commitment to war over the last 100 years. The #LovelyWar project was organised to use performance and music to make new connections and contemporary resonance in the local ANZAC Story. The graduating acting company at the Arts Academy, Federation University, with Present Tense Artistic Directors Bryce Ives and Nate Gilkes, created a series of performances, concerts and community events around ideas of remembrance, reflection and investigation on the centenary of ANZAC. This inspiring project brought together the Federation University, the City of Ballarat, the Ballarat RSL, Sing Australia Choir, Arts Academy acting students and the broader community. The work aimed to connect community members with Arts Academy actors, and to encourage cross-generational collaboration and work. The students reflected on the meaning of ANZAC and what it is to remember a significant event of 100 years ago. Their work stemmed from a reimagining of Joan Littlewood’s Oh, What a Lovely War. Present Tense spent over 40 days investigating and creating the #LovelyWar works at the Arts Academy Federation University Australia. 7 public performances of Oh What a Lovely War at the Helen Macpherson Smith Theatre, with the Graduating Acting Company. A community activation, on the balcony of the George Hotel for ANZAC Day for the Gunfire Breakfast, with songs and music from the First Year Acting Company, the Graduating Acting Company, the Sing Australia Choir, the Ballarat Memorial Brass Band and Federation University Pipe Band. 3 pop-up concerts at the Art Gallery of Balllarat, for Ballarat Heritage Weekend, working with the Art Gallery of Ballarat Ladies Auxiliary, the First Year Acting Company and the Graduating Acting Company. 2 pop-up concerts at the Regional Living Expo Conference, working with Regional Arts Victoria. 1 video shoot, interviewing members of the Ballarat RSL Day Club collaborating with Wind Sky Productions and the George Hotel. Performances of songs and stories from our work on ABC Radio around Australia on the Rhianna Patrick Program, ABC Ballarat Breakfast, Power FM Breakfast and Win Television News. A community activation for Ballarat Heritage Weekend, the graduating acting company, and the first-year acting company, working with the City of Ballarat and Ballarat Heritage Weekend, retracing the steps of the original ANZAC march. A pop-up concert for the UNESCO Heritage Summit at the Art Gallery of Ballarat. Regular morning teas, open rehearsals and shared conversations with the Ballarat RSL, the Ballarat Legacy Club and Sing Australia. Shared rehearsals and investigations between the First Year Acting Company and the Graduating Acting Company, encouraging greater dialogue, collaboration and collegiality. We’re not on any specific mission. We’re not attempting to rewrite history. We’re not here to debunk mythology, or to be jingoistic, or to tell you what you want to hear, or to educate you on our perspective. Instead, tonight, we present our shared investigation, as the Centenary of Australia’s involvement in the First World War dominates our national discourse. We ask: what is war, and what does it do to the human animal? Through our investigation, we wonder what we are capable off, remembering that our ensemble is roughly the same age as those women and men from Ballarat a century ago who signed up for King and Country. We ask deep and personal questions of politics, of memory, conflict, of the scars that still exist today. Some of tonight may be poignant, other bits will be hard. We make no apologies for that. There is no one answer. War must be the most complicated and complex topic one can investigate. We nod in appreciation, not towards governments that often make unfair and harsh policy, but instead to the women and men who today are still fighting in conflicts around the world. We remember the victims, those that are documented and still make our nightly news bulletins, and equally those that we ignore or forget. We wonder why so many women and men, Australian soldiers who served in Afghanistan and Iraq, are committing suicide. Over 250 since those two conflicts begin. We feel disgusted that in Ballarat we have veterans who are homeless. With so much money spent this year commemorating ANZAC Day, it's vulgar to think men and women who served live in poverty. We wonder what would we do if we had served in Vietnam, or PNG, or in France or Gallipoli. We feel honoured that so many members of the Ballarat community have been willing to sit with us in this investigation. To talk, to share stories, to inform our workTo reveal pain and love, loss and fear. We particularly acknowledge the Ballarat RSL and the Ballarat Legacy Club. organisations that continue to do so much good work, often under recognised and under-celebrated. We acknowledge Sing Australia, the City of Ballarat and many others who have gone out of their way to help us. We acknowledge our elders, the senior members of the Ballarat community who have offered us wisdom and advice. We especially acknowledge our Indigenous brothers and sisters, who were almost written out of the history of Gallipoli, yet they were there. We acknowledge Joan Littlewood, one of the greatest theatre makers of all time. A woman who literally shook the foundations of everything around her. We take inspiration from her to be bold, be inquisitive and to remain committed to training. We thank the Arts Academy for opening its doors and letting us share this conversation through so many means: in concerts, on the street, in art galleries, in conventions, in one-on-one conversations, in morning teas, in social media. Federation University has had no agenda and asked for no control. We particularly acknowledge two brave and remarkable artists: Kim Durban and Angela Campbell, who remain fierce in their commitment to excellence in training. Finally, we acknowledge the graduating acting company, who have grown through this process. They are willing to open their eyes, sit in empathy and ask the unanswerable question: why? Personally we dedicate this to our grandparents. Blue-collar workers, who signed up and fought. During this investigation our thoughts have turned to them. Margaret Fulton is more than just our national cooking matriarch, she is a living legend. Her life story is full of the ingredients needed to make a musical. 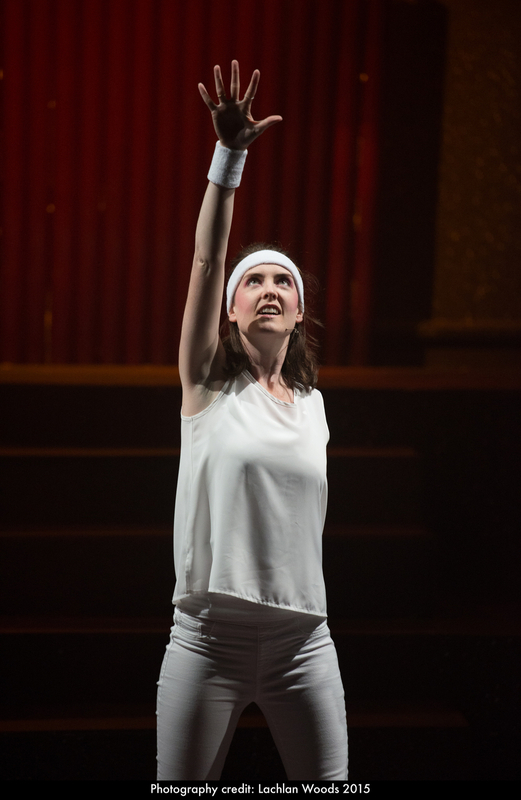 In November 2012 the Present Tense ensemble and Theatre Works presented the Australian premiere of a new musical about national living treasure Margaret Fulton. The work was supported by the City of Port Phillip Cultural Development Fund. Doug MacLeod (head writer and producer of The Comedy Company and Fast Forward) and Yuri Worontschak (composer of everything from Fast Forward to Shaun Micallef's Mad as Hell) collaborated with Present Tense to bring her unique and surprising story to the stage, in this highly original musical experience. Stage and music directors Bryce Ives and Nathan Gilkes are marginal no longer. For members of the Present Tense ensemble (mostly born in the eighties) it’s staggers us to think at some point not so far in our recent past eggplants and olives were strange foreign items not to be found in Australian kitchens or supermarkets. It may seem cliche to say, but we have come a long way. Australia is certainly not a perfect nation, not even close, and the recent misogyny in our Parliament reminds us that there will always be new challenges to overcome, particularly for women. Tonight we passionately say despite all of this, we have indeed done a lot of growing up. The Australia of Margaret Fulton’s youth is a distant memory, and in it’s place sits a vibrant multicultural country, that eats exceptionally well. Food is crucial to the development of modern Australia, and Margaret Fulton is central to all of this. We love that this is the story of a strong Australian woman. Margaret Fulton is more then just an icon, she has lived her life to the fullest and always been authentic and true. She was not an invented brand. Her brand was authentic, honest and reflected her integrity. We’ve taken a huge risk in developing Margaret Fulton: Queen of the Dessert. As a group of artists we have chosen to allow the work to organically develop and grow. This is a constant work in development and we’ve actively decided to stage this season on the smell of an oily rag, away from the pressure of commercial investors, giving us the chance to breathe, to grow and develop with an audience. You are crucial to our growth and development. The goodwill shown towards this work is testament to our belief that communities want more local and creative musical theatre work. Over one hundred individuals donated their own money to our Pozible campaign. Theatre Works and the City of Port Phillip gave us the assistance to get this idea off the ground and realise this season. Many, many, many individuals have sent us tea towels and cook books. We are thankful for all the love, good will and support that has been offered. We must thank the Present Tense ensemble, our guest artists and production team. I'd also like to thank my kitchen cabinet: Doug MacLeod, Yuri Worontschak, Nathan Gilkes and Sean Bryan, for their tireless work in developing this show. Doug and Yuri have been working on this idea for quite a few years, their passion and dedication is infectious and I hope we have served them well. Finally, we do this for Margaret Fulton. Her support, input and encouragement has been invaluable. If this work achieves nothing else, we hope that it letsMargaret know, on behalf of us, that Australia loves her very much.